Today Verizon held an event in New York City to announce a partnership with Apple for a “multi-year non exclusive deal” to bring the iPhone 4 to the carrier starting early next month, February 2011. Apple COO Tim Cook took the stage after the initial announcement to discuss how the Verizon iPhone 4 will connect to CDMA and not LTE. This means the device will not only not take advantage of the carrier’s speedy 4G network, but it will also drop data connection during voice calls. This means no internet surfing or video while on calls. 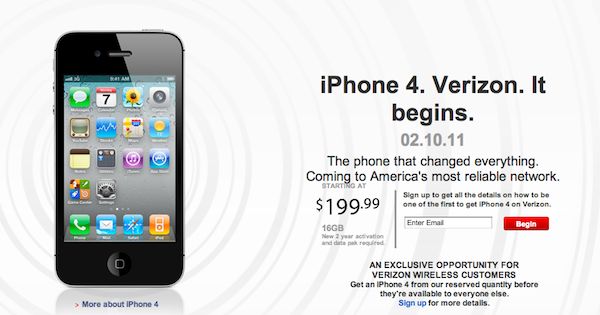 Verizon has since updated their website with a preorder page and an expected public February 10th release date. Verizon wireless customers can reserve their device starting Feb 3rd at $200 for the 16GB model or $299 for the 32GB model, of course both on a two-year contract. Another interesting note about the Verizon iPhone is it will act as a 3G hotspot, allowing you to connect up to 5 other Wi-Fi enabled devices. This is something the AT&T and most other carrier versions do not support. Previous Entry: Google TV Jailbroken, Angry Birds Coming Soon?